Anyways, I had an idea. How about all the characters get a MAX system, all related to them in some way. Like, maybe Ren could get a kind of flying knight(Jet Calibur[/b]?) with an upgraded Slicer. Nakida, I have no idea... Maybe a water suit. Anyways, I have three episode ideas. Dekaen, a new member of the Fire Tribe born with the energies of Donkaen and the Blue Dragon, appears to inspect the Earth for whether it was time for Donkaen's revival or not. Seeing the world unfit, he goes into a rage and begins to attack the world, causing the old firefighters and the new Rescue Fire take action, with Rescue Fire's veteran members using the Rescue suits, and they take down Dekaen, who was eventually captured by the Blue Dragon. Dekaen agrees to return within another year(or so). Kaisu's could be 'Enemy from the Past! Enter, R-FIR3! ', where the Mafia leader comes, but only finds Kaisu, after his real identity was leaked. After being attacked by the powered-up Mafia leader, who joined New Terra, he loses his Pheonix suit, Core Scuba NX suit and Core Scuba NX. Note that the Dash's have been taken away. 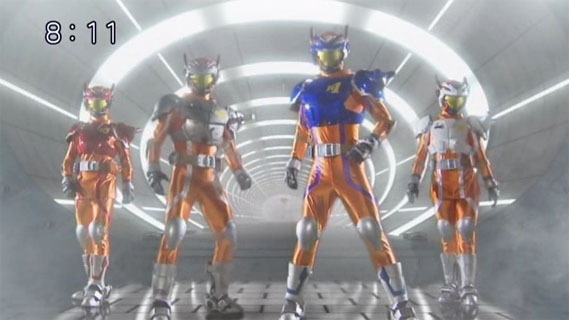 Then Ritsuka and Tsubasa appear in their respective vehicles, and Dash-3 with the upgraded Rescue Megaphone F3, goes to Kaisu, who combines his Commander and Megaphone, doing a cool new henshin sequence to upgrade, taking down the New Terra leader with Ritsuka's help in her repaired Fire-3 Suit. Lastly, 'The Secret to Fire! Donkaen, re-awaken Fire-1!'. Yuuma - Ever since Tatsuya dissapeared... I'd carried on his dream. Tatsuya - With Donkaen re-appearing, the world is on alert. R? - We have no choice but to take him down. Hikaru - Explosively Suppress It! Rescue Force, Emergency Sortie! We already have an upgrade unit, I believe it's official name was Rescue Seraph, an angel based upgrade developed by Cross that anyone can use. Other than that I like your ideas. But as for the Dekean one...I'm not sure. I don't know if I want a new group of characters introduced like that. I have considered upgrading the Force suits, but that's the closest I want to get at this point. Appearence/Capabilities: To activate the Seraph mode the "Heaven Chaksou" card (of which there is only one) is required the card appears like a normal rescue force card, the picture displays an R symbol with a pair of white, feathered wings emerging from behind it. When slashed through a commander the card takes instant effect. The users chestplate and helmet seperates and hovers over the user acting as a Chaksou Container would. the seperate armor flies outwards and generates several pale red view screens that scan over the undersuit and change it's colour to white, the lines running across it change color to light blue (or dark blue, or gold, or red or anything angelic looking really), begin to change their pattern and flow over the suit until they reach the back of the suit where they create two spirals and then end. From the spirals a pair of white feathered wings (still with the lines forming patterns around them) emerge and at this point the armor re-attaches itself to the suit changing it's color to match the undersuit's lines. The helmet re appears, the visor becomes light blue (if the lines are already light blue then the visor becomes yellow) and that little headpiece thingy changes to match the armor, lines and undersuit. In terms of weaponry the form gains access to the prototype "Halo Slicer" The weapon retains the shape of a normal Rescue Slicer colored white (blade) and blue (bit above the handle) but with a golden ring around the handle and four buttons placed on it, a red one at the top that when pushed activates the attack "Flame Ring" which creates a ring of fire around the targets that closes around them and then destroys them, a black one on the right that when pushed performs the "Land Ring" creating a minor earthquake around the target, the third button on the bottom is blue and engages the "Aqua Ring" when pushed this attack surrounds fire's or enemies with a ring of water that freezes instantly on contact, the final button is green placed on the left of the blade when pushed initiates the "Sonic Ring" that is basically a sonic divider surrounding the enemy and then closing in. Appearence: Loaded into Rescue Phoenix's nose cone Core Phoenix is a bright red robotic bird, it has a gold crest with the Rescue Force insignia atop it's head and sharp pointed wings which are made up of four large "feathers", each of them have a cylindrical missile pod under each of them that can launch missiles charged with the Halo Slicer. It's beak, the tip of the wings and it's talons are gold. The vehicle has bright green eyes. The control room of the vehicle is a grey control room with a column in the middle which the Halo Slicer can be placed into and will become the vehicles controls (a joystick) by pushing one of the buttons on it's handle the vehicles weapons are charged by the respective element (Green = air, Red = Fire etc.) The column has a spot where a Rescue Commander can be attached. Final Rescue: Phoenix Storm, When the Final Rescue card is swiped the column unlocks and allows the sword to be removed. Once it is removed Core Phoenix fires all of it's missiles at once (watch Robotech Macross and you'll get a good idea of what it looks like) and either Freeze, Fossilize or Trap the enemy within a cage of Fire or Sonics. The pilot then slashes Rescue Slicer down towards the target several times with Core Phoenix following the slashes with the final one (a thrust) sending the vehicle straight through the centre of the target. Might as well mention the Crisis Force team as well. C3-sure, he can appear next time we're in End City. Ah, okay. That would work. Also, will we have a sequel after this, if it's still going? I have plans for a sequel, yes. Got an idea for a new Crisis Force or New Terra member. Disaster and Source of Disaster: Hello Rescue Force. I'm a great admirer of your work and I'd like to put you to the test. I have four Disaster Generating machines in my possession and a similar amount of hostages. Each hostage has been placed in dangerous proximity to one of my devices and will probably die the moment it is activated, you will have a set time to find the EDG and figure out how to shut it off, without using a Final Rescue. If you should use a Final Rescue then all four devices will be activated along with the large amounts of explosive attached to each hostage. Each hostage you save will give you a clue to the next devices location and functionality, and tell you how much time you have to find it. Your first clue, is the color red. You have 12 hours to find the first device. Location(s): I've planted my toys around End City, one of them is in the Subway system, another on the Highway, one Downtown and a fourth in Midtown. Commanders Involved (if any): No need to worry, I'm just a simple, bored human. Footsoldiers (Yes or No): No. I have no access to footsoldiers, just the devices. Anything Else: Sorry, this show called Sherlock just finished airing in the UK, the series finale was pretty much this ... but with bombs. Anyways, the killers identity is Saeko Miyamoto, so at the end of this Akiko and Hiro are going to recruit him into Crisis Force so we are unfortunately not allowed to catch him (that okay?). Also I was thinking the last hostage could be a member of Rescue Force? Sherlock finished already? I need to track that down online that means. It's on the BBC iPlayer if you want to watch it. And they are going to make another series at some point, but I think we may have to wait a while because Steven Moffat has his hands full with Doctor Who. Who would be the hostage though? Hikaru? What about Kyousuke? I was actually thinking one of the actual team, like Cross, Nakida, or Ren? I'm not in Europe, so it doesn't work for me. I'll find it somewhere else, just like I always did for Doctor Who. I actually think Hikaru could make a pretty good hostage. Maybe both Hikaru and another character from the actual team. If you think about it, other than Hikaru, all the others are pretty open. Sakura, I don't know. Nakida would easily be suprised, Ren would have to fight with his bare hands against them and Cross would still be injured. With the new episode-exclusive character, we'll see new technology enabling new forms! Deus, Cosmic Synchronization! Henshin, [фrbiterra]!!! The primary form. Visor is split into two by a single line, representing the name. Silver mix of G3-X armour and the UFDA Rescue Force suits. Aqua form with a double-sided harpoon. Colour scheme changes to Green-Blue with silver highlights. Has the ability to drain and fire water along with breathing within it. A red and silver scheme allows for a gattling gun to fire small missiles along with being impervious to fire. A green and silver scheme with a rod that changes for to make a great variety of blades of halberds to katanas. With a a golden yellow and chrome scheme the bladed hammer this form carries can drain electricity to power up it's own attacks. The red, blue, green and yellow colours are all merged into a form that feeds of anger as it enables weakened capacities of the other forms. The fastest form in the фrbiterra arsenal, a series of attacks faster than sound will easily overcome opponents as white streaks the air. With a 5-second self-destruct feature this is the most powerful form.The power stored could destroy the Phoenix and Baastu in a single blow. A shining light that changes White>Blue>Green>Yellow>Red and then destroys itself in a golden blow. Unus, Ruin's Omen! 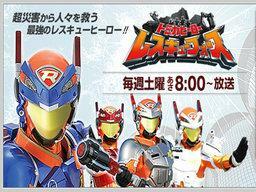 Henshin, [мдтяӀӄѕ]!!! Based off New Terra technology, this will remove the body's cells and replace them with armour for a painless, powerful henshin form. Due to the brain's exposure, an AI chip will activate to make up for the lack of power.